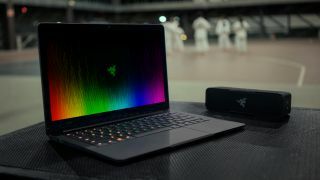 Razer has cooked up a new recipe for its Blade Stealth, with the refreshed Ultrabook now having an Intel 8th-gen quad-core processor as a fresh ingredient. The new spin on the Razer Blade Stealth revolves around the Intel Core i7-8550U processor to be precise, a quad-core (eight-thread) CPU with a base clock of 1.8GHz and Turbo speeds up to 4GHz. (Previously, the notebook had a dual-core Core i7-7500U chip). Intel’s latest processors aren’t just about raw performance, and also bring improvements in power-efficiency. In fact, Razer claims battery life for the stealthy notebook goes up to 10 hours of longevity. That will naturally vary, of course, depending on what you’re doing with the machine. Otherwise, it’s essentially the same as the original 13.3-inch Blade Stealth with 16GB of dual-channel system RAM on board, and a Quad HD+ (3200 x 1800 resolution) IGZO touch-enabled display. The Ultrabook measures 13.7mm thick and weighs just a smidgen under 1.35kg, with a chassis fashioned from aircraft-grade aluminum. It also boasts a back-lit (Razer Chroma) keyboard. The Razer Blade Stealth is priced at $1,699 or £1,669 (about AU$2,170 ) with 16GB RAM, and a 512GB SSD. It’s available today in the US and UK at Razer’s online store. Should you want to juice up the notebook’s pixel-shifting prowess to attempt to tackle some gaming (outside of casual games), then you might be interested in the revamped external GPU that Razer revealed alongside the Blade Stealth. The refreshed Razer Core V2 has been given an internal redesign which means that taller graphics cards now fit into the enclosure – it supports Nvidia’s latest GeForce 10 series GPUs and AMD Radeon 500 series cards. The Core V2 also comes with a newly added second Thunderbolt 3 port, along with four USB 3.0 ports, and a Gigabit Ethernet connector in case you want to hook up other peripherals. It’s priced at $499 or £499 (about AU$640) and will ship ‘soon’ in the US and UK. Of course, you’ll also have to pay for the graphics card to go inside it – which you might pick up at a bargain in the UK come Black Friday. You could even find it on sale during Black Friday in the US or in Australia, too. Could this refreshed Ultrabook make our best laptops list?